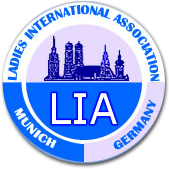 LIA’s General Meeting takes place on the 4th Wednesday of the month at the Heide Volm in Planegg. Each month there is a speaker or a programme scheduled for the GM and afterwards members often stay for lunch. If you wish to attend please let us know by Contacting Us. In lieu of a GM, a picnic is organised for August and in November LIA has its annual Fair. The November Fair is open to the public from 10.00 to 14.00 hrs. LIA members sell i.e. homemade products, 2nd hand books, clothes, accessories, Christmas decoration etc. All proceeds of the Fair go to the charities LIA supports. The Christmas lunch in December is for members only.